Southern Matriarch: Ready for the Hop, Hop? Princess calls bunnies "hop,hops." She is action oriented what can I say? For the longest time all animals were named by either the sound they made or their signature action. So bunnies are hop hops. Are you ready for the big bunny to visit this week? For once in agggggeeeeessssss I will not be sewing madly on Good Friday. There are advantages to having to mail things across the big pond. Of course, I would much rather be sewing on Easter Saturday if it meant my babies were here. ::sigh:: I am happy to say that the Easter finery has even made it there though with time to spare. Whew! Princess and Master Wildman love Peter Rabbit. Love! So Peter Rabbit it was. I pulled out my tried and true Children's Corner bishop. I wonder sometimes why I have any other patterns. I have made this one more than any other pattern I own. I used Gwen Milner's Peter Cottontail. I used him here several years ago. Before anyone comments or emails me asking where to get the plate, it is out of print. I sure wish Gwen would re-release the plate. You might have luck on ebay or Etsy. I am not quite sure why it is rippling so badly. I blocked it both before and after I smocked it. Oh well. 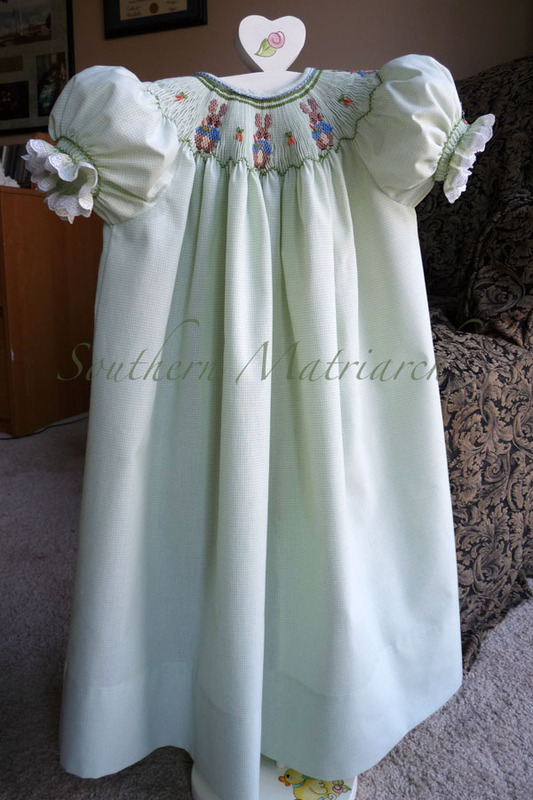 The fabric is a Nashville Cotton poly/cotton blend. 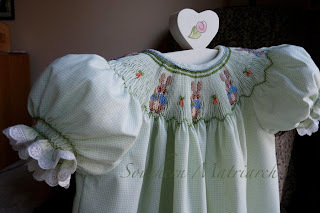 Sleeves are trimmed with Swiss eyelet. I embroidered bullion carrots between the bunnies. I must have stretched the entredeux as I stitched it to the neck band. It is cupping up just a tad. Then blue floss is stitched into the entredeux. Why did I do so many buttons? Her mother will be grumbling my name. The buttons match Peter's blue jacket. What will I do when she outgrows this jacket? I lengthened the sleeves and hem 1/2" for our tall young lady. The carrot applique is available from SWAK Embroidery. I just merged three into one. Yes I have officially lost my mind. I did bullion carrots on covered buttons. It may have been one of those little "fiddly" things but they did turn out cute. 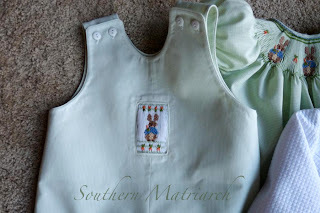 The buttons on the collar and along the hems are craft buttons from JoAnn's. Master Wildman's longall is Children's Corner Johnny. I had originally planned to do an insert with three bunnies. As you can see, that didn't happen. So he has one bunny. I had never done a "window" insert before. It isn't 100% the way I wanted it, the seam allowances shadowing through from pressing drive me nuts. Oh well, it is still cute. I bordered his bunny with the bullion carrots. That does it for my Easter sewing. 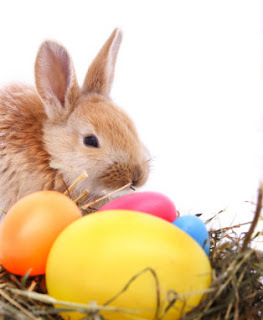 If you aren't finished with your Easter creations, time is speeding by. Get off the internet and stitch! 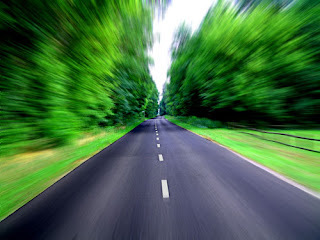 I am headed back to my sewing room. Look at the ticker below, that new baby is speeding its way here as well. The cradle is being refinished as we speak. 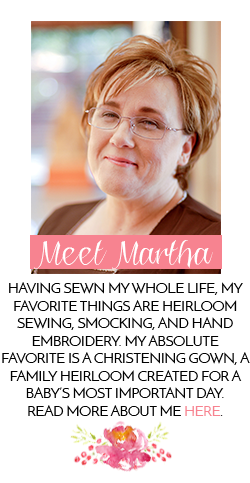 These are all so perfectly sweet and lovely, Martha. Have a wonderful Easter. You've earned it. From other photographs and discussions, I did not realize the bishop's back buttons were blue. I love that extra touch of contrast! Shadowing through seam allowances drives me bonkers, too. Glad to know I am not alone, but also think it is sometimes beyond our control. Even if we use special sewing, pressing tools and techniques in our sewing rooms, chances are those same things would not be used by the special mommies who eventually launder many of our creations. It is the joy of creating and watching them being worn, even with small imperfections, that is more important. May you and all your loved ones receive the many blessings of Easter! Cute! Your grandchildren are certainly well dressed. You are a Stitchin Granny! 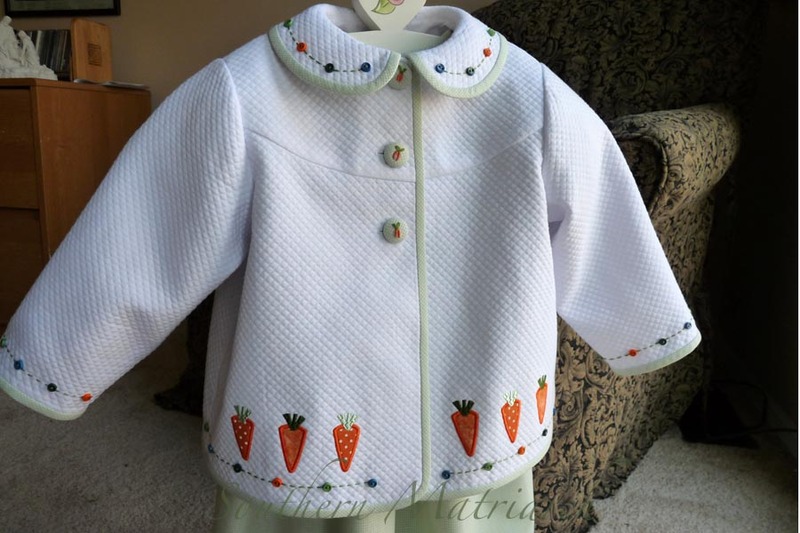 They are absolutely lovely, I especially love the carrots on the buttons. So few people think to add those very special touches. Have a lovely Easter. Beautiful! 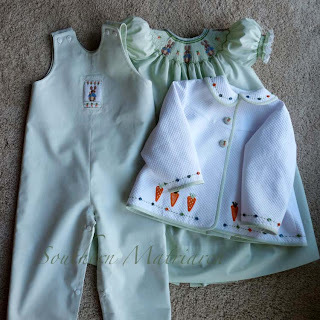 I love the smocking interpretation with all the carrots. They are charming additions! The little matching jacket for Princess is so special. You always do such an amazing job with your creations! Happy Easter! I LOVE this dress! My first child's birthday is in feb 2016 and we are going to have a peter rabbit party. 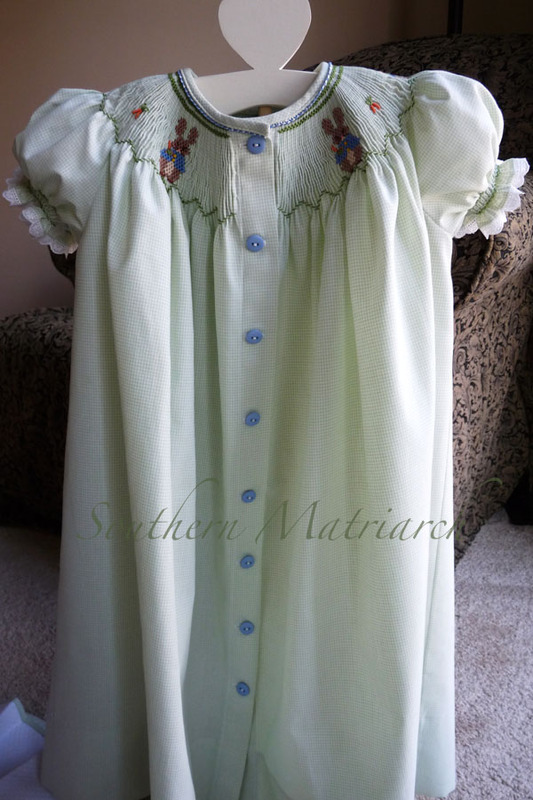 Is there any way I could purchase this from you or purchase the pattern to have someone make this for her? Thank you! Your work is beautiful?